I am not an organized person by nature. There. I said it. Now you know my secret. Organization is not in my DNA, I have to work on it. Every Single Day of my life. I love to "collect." Some of my collections have turned into clutter. 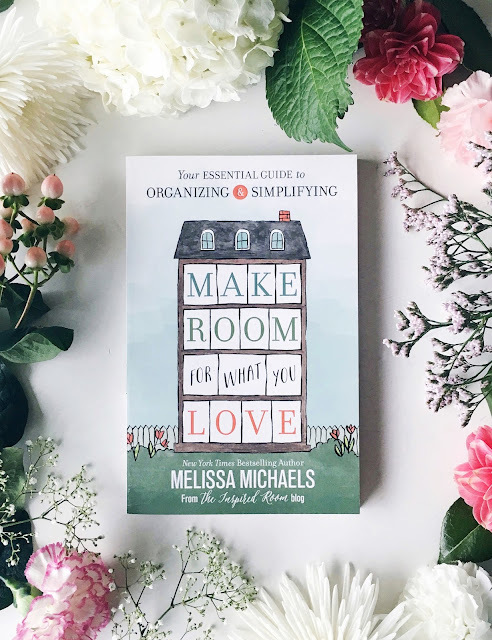 I love what Melissa says, "Your story has wonderful chapters from the past that are worth and wonderful to remember, but don't let your home get stuck in a time capsule. It's okay to let past trinkets go in order to make more room for what inspires you now. They served their purpose at that time. Now make more room for who you have become." 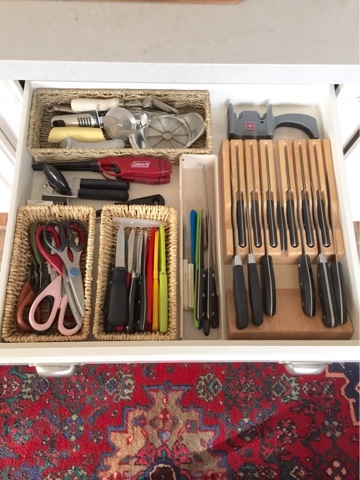 When organizing our kitchen, I took EVERYTHING out. Literally put it in boxes and only brought in what we needed. The first step for me was keeping all the clutter OFF the countertops. If it couldn't fit in a cabinet or drawer, it was left in the storage area. 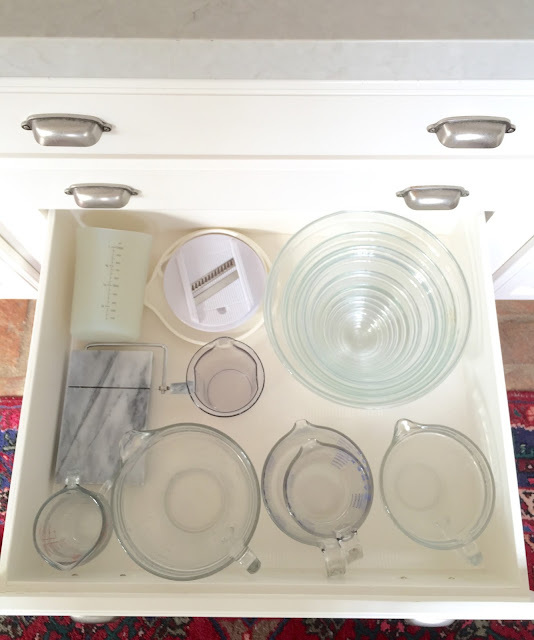 Since the island is the hub of our kitchen, I will show you how I organized my most used kitchen essentials. 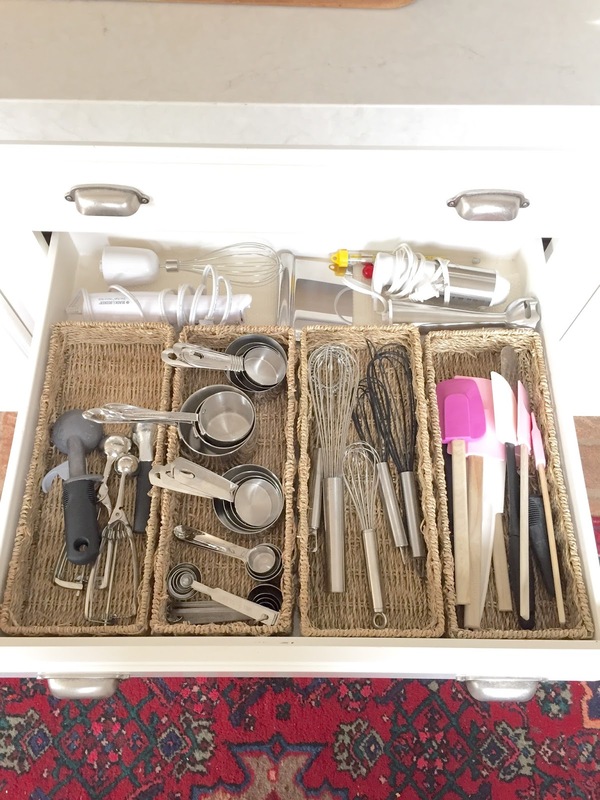 These drawers hold the key to my organized kitchen. The top drawer is for all of my sharps. I have this thing with kitchen shears. If you don't own some, you are missing out! I use them for everything food! Why aren't my knives in a big block on the counter, you ask? Probably because I watched a scary movie at some point and it involved a knife being pulled from a block on the counter. I don't need the boogie man having quick access to my knives. :) This handy dandy knife holder keeps them off the counter and out of sight. The second drawer holds all of my baking utensils. I really do use multiples of all these items! The baskets are unfortunately discontinued. I have searched everywhere for you. If you find them, please comment and let me know so I can share with my readers. The third drawer holds my mixing bowls, multiple liquid measuring cups, a cheese slicer (not sure why that is there other than the fact that I had space there), and a round little slicer thingy that I bought at the fair 20 years ago... I love that it fits my mixing bowl and I can just slice right into the bowl. The fourth drawer holds industrial sizes of foil, plastic wrap, and sandwich bags. 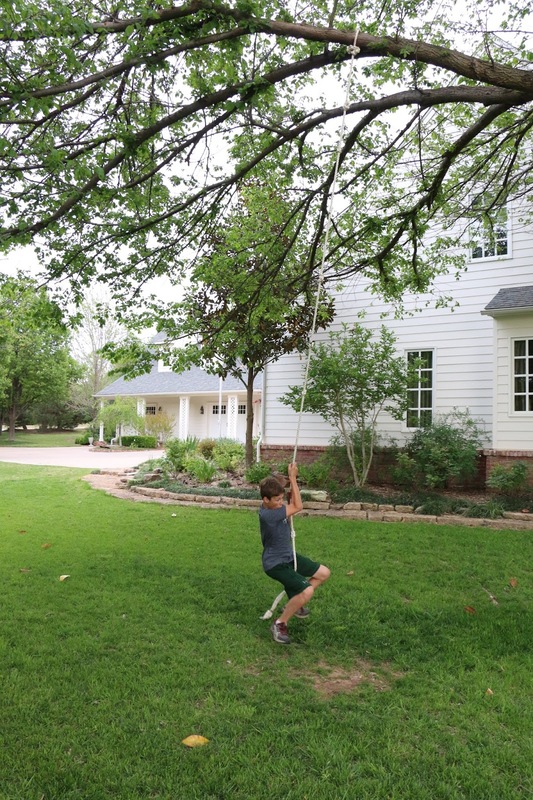 Everything is within easy reach and is usable. By eliminating the clutter and making room for what I truly use and love, I have made our kitchen a place of enjoyment. The boxes of extras are still in the storage room... three years later. It's ridiculous. I promise it is my plan to haul that extra stuff off and donate it this summer!! 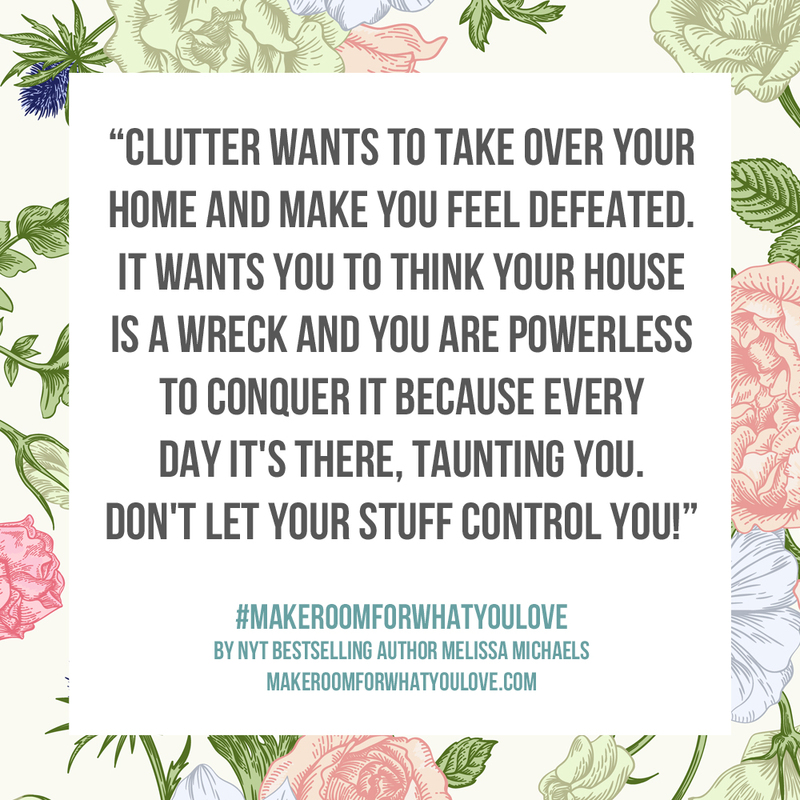 Now, you may be asking yourself, How can I start decluttering my house? Start with one room... look at the surface space and clear it all off. Are there magazines and catalogs you haven't looked at yet? Toss them in the trash. Don't feel bad about it. When is the last time you have actually ordered directly from a magazine? I have a stack I keep meaning to look through. It isn't happening. I always end up google searching what I am looking for anyway. Into the trash they go! 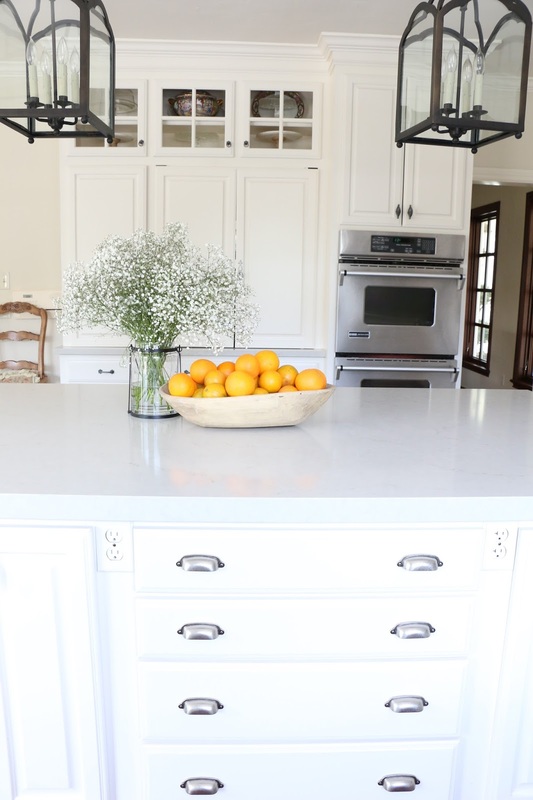 Do you have an appliance sitting on the counter that you haven't touched in a month? Find a place for it under a cabinet or in the pantry. Voila! An empty space! Organizing doesn't have to be costly. 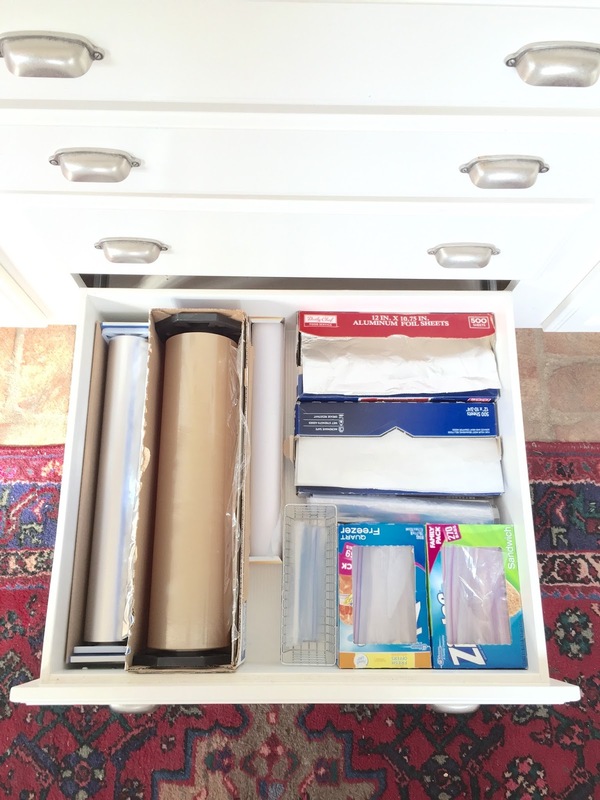 Thrift stores sell all sorts of containers that can be utilized for organization. Or you can make your own out of small cardboard boxes covered in contact paper. Start small, one drawer at a time. You can do this. 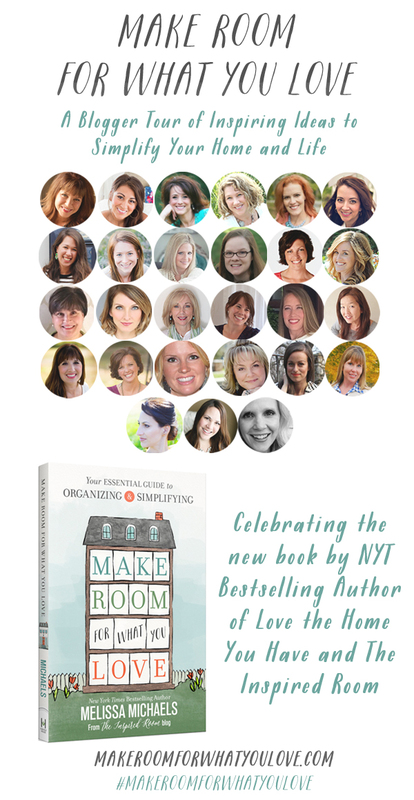 Join my friends and me as we participated in "The Make Room Challenge." Visit their blogs today and see how they are simplifying their homes and lives. 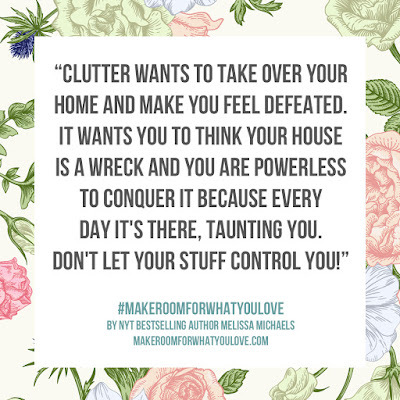 Thank you, Melissa, for including me among this wonderful group of bloggers and for inspiring me to continue working through my own home to make room for what I love. If you are new to my blog, I would love for you to follow along with me. Enter your email in the box on the right to "Subscribe." Like what you see? PIN IT!! SHARE IT!! COMMENT BELOW!! I really like the way you have organized your kitchen drawers. Drawers beat shelves every time. Great tips. I really like the idea of emptying everything out and only bringing things in when you need them to see what you REALLY use. I've really been wanting to get stuff off my counters (partly because I bake a lot and would like to be able to utilize my counters better), but I'm in a kitchen that was built in the 50s, and so that means limited drawer space (especially since some are starting to fall apart). However, that knife tray is fabulous! Where did you get it? I have to declutter again too. You are so beautifully organized. Emily, I love that you like drawers too! I recently reorganized our kitchen and moved my cookbooks that were in some drawers to another location. Now, some food is stored in them and it is a better scenario since they are so accessible! Love your post! I had seen the baskets for drawers at Walmart. My local one had them a few months ago. Oh goodie! I looked at three Walmarts near me and was told they no longer carry them! Thank you! How wide are the drawers in the island? They look to be maybe 30-36"? 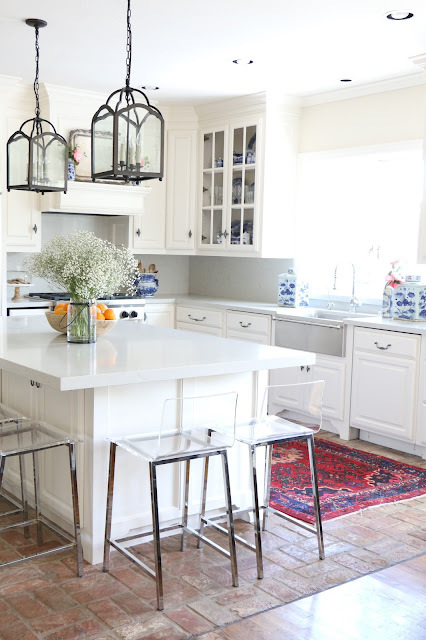 I would dearly love to have so much space in my kitchen. One of these days, perhaps! When the time comes, I'd love to have drawers like that. My kitchen is so tiny. 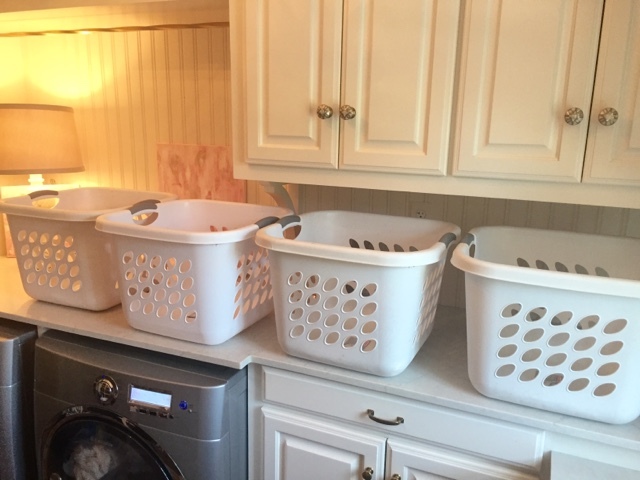 A mere 10x7— with only two sets of drawers (18" & 14" wide), and the only lower cabinets are under the sink and one lazy susan corner cabinet. 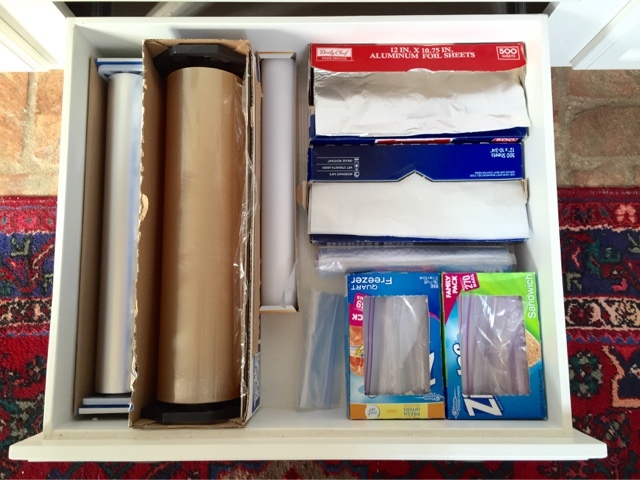 I do have my drawers set up similarly, with baggies, foil, etc. in one bottom drawer (but no industrial sizes! ), mixing bowls and glass measuring cups and colanders in another; one small drawer for what I call "things that cut” (scissors, garlic press, pizza cutter, rasp, etc.) 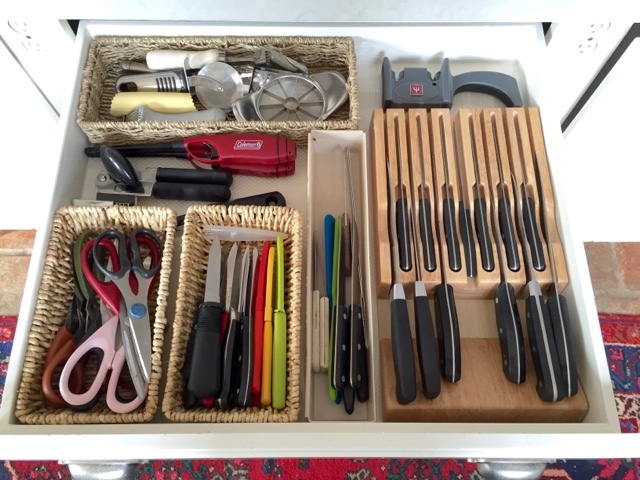 --but knives are on the counter in a block due to the lack of drawer space! 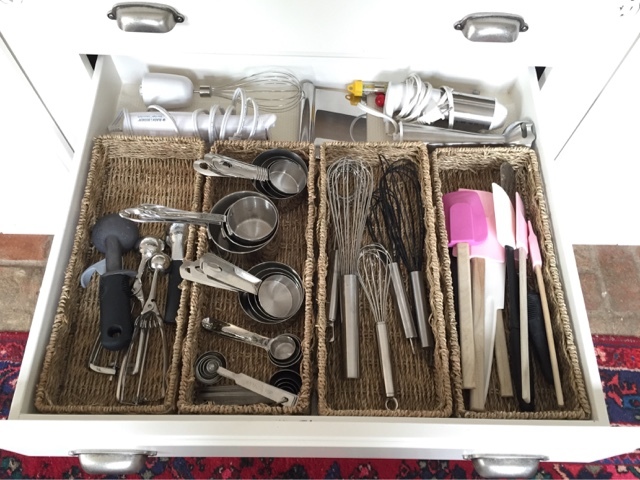 I also have a drawer for "cooking things" (measuring cups and spoons, whisks, spatulas, etc. ), and a drawer for "serving things" and misc. And, of course, there is a drawer for silverware and one for linens. Anyway, my kitchen is so small, I have to have things on the counter--also have a pot rack over the sink. It's a constant struggle to keep things edited and neat. 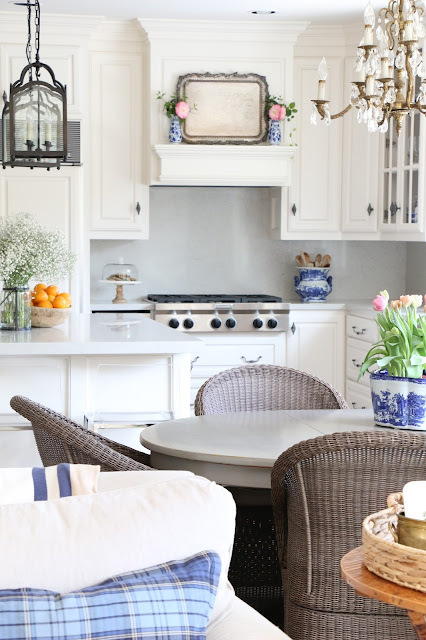 But I dream of one day having such a lovely kitchen as yours! I'm keeping pictures of yours in my idea file for my future kitchen!